The day has finally come, people. Football Manager 2018 is officially out which means it’s time to say goodbye to your social life and fire up that precious first save. 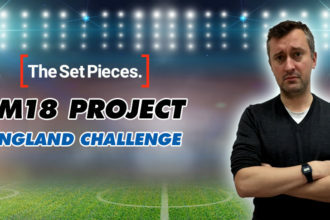 Deciding which club to take charge of from the thousands available is always extremely tricky so we’ve made it easier for you by selecting five for you to consider. You can thank us (or perhaps more likely, curse our names under your breath) later. With just under a third of the Serie A season played, the competition’s newcomers Benevento have already made history. Unfortunately (for them) their new-found place in Italian football’s record books is an unwanted one as they’ve become the first team ever to lose all 12 of their opening league fixtures in the top flight. Ouch. Marco Baroni, the man who masterminded their promotion via the play-offs last term, was unceremoniously given his marching orders in late October following a 3-0 home defeat to Fiorentina and his replacement in the hot seat, Roberto De Zerbi, hasn’t fared much better losing all three of his games so far. 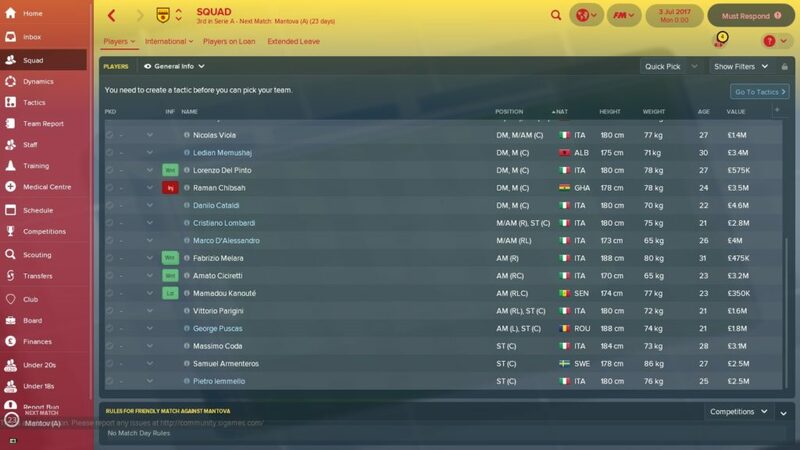 On Football Manager 2018, you won’t be taking charge of a club who have made the worst start to a Serie A season in history, but it’s still a monstrously difficult challenge nevertheless. All the signs point towards a long, hard slog in the bottom reaches of the division. For starters, you’ll be inheriting a squad that is wildly dependant on loanees (there are 12 in total, the pick of whom is Lazio midfielder Danilo Cataldi) and that’s probably how it will remain as you’ll have a measly budget of £1.33m to play with and just over £4k cushion in wages. Normally, this would be a job for one man only: Sam Allardyce. However, with Big Sam™ holding out for bigger, more lucrative offers from elsewhere, the task of steering this minnow to safety falls squarely on your shoulders. All the best. N.B. Decking out your avatar with a terracotta tan and open-buttoned shirt are optional requirements for this role. Positives: One of your loanees is called George Puscas. Great name. Negatives: This will most likely kill your soul and probably put you off the game for life. Tata Martino may have presided over a rare trophyless season in charge of Barcelona and a Copa America final defeat with Argentina in recent years, but he is finding success far easier to come by with Atlanta United in their inaugural MLS season. Despite only being founded this year, Atlanta have surprised many by bumping shoulders with the Eastern Conference’s most established clubs at the top end of the table. With a fanatical fan base cheering them on and a squad sprinkled with South American flair, they have undoubtedly been the story of the MLS season, both on and off the pitch. At virtually any other club on the game, you’ll inherit a whole lot of history, both good and bad, but the beauty of Atlanta United is that they are a blank canvas. 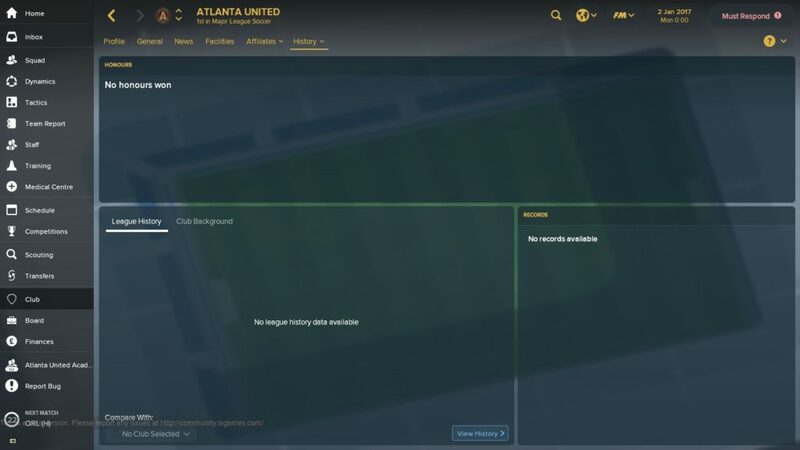 If you follow in Martino’s footsteps and get Atlanta firing from the very start, your reputation within the game will soar. Get it wrong, though, and you’ll forever be remembered for being the first to fail at the newest MLS franchise. The stakes are high with this one but it is an exciting challenge to take on nevertheless. Positives: Miguel Almiron is a Paraguayan wizard, Fulham legend Carlos Bocanegra is your Director of Football and the kit is a beauty too. Negatives: Brad Guzan is your goalkeeper. On May 25th 2014, Leyton Orient found themselves 2-0 up against Rotherham United at half time in the League One play-off final with a place in the Championship firmly in their sights. A couple of Alex Revell goals and an unsuccessful penalty shootout later, and the O’s instead had another season in the English third tier to prepare for. Fast forward to the present day and the notion of Orient playing in the Championship is a difficult one to envisage. This is a club, after all, that has suffered back-to-back relegations and slipped out of the Football League entirely last season, ending a 112-year stay in the top four divisions of English football. Orient’s fall from grace is a well-documented story. The club was virtually run into the ground by their former owner, Francesco Becchetti, and almost went out of business completely before being salvaged by a consortium led by lifelong fan, Nigel Travis. 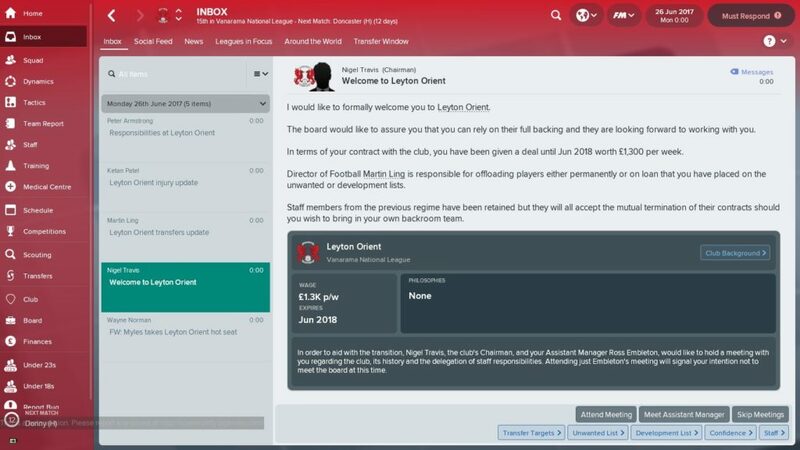 That Orient survived when at one stage it looked like they could fold is a feat in itself, but the club has found negotiating the National League a difficult task. They are currently far closer to the bottom of the table than the top. It has been a turbulent few years for the East London club and your task is to lead them one step further than they managed back in 2014 – by realising the Championship dream. Positives: Becchetti is no longer around, hurrah! And there are a few talented youngsters to build around for the future. As you have probably noticed, Celtic are quite good at the moment with Brendan Rodgers at the helm. As well as winning every domestic trophy in sight, the Bhoys broke their own 100-year British record for domestic games unbeaten when they thrashed St Johnstone 4-0 earlier this month, stretching their run to 63 matches. Celtic have lifted the Scottish Premiership title in the last six seasons and are relentlessly hunting down their fierce rivals Rangers’ record of nine in a row, but the one team that has caused them the most trouble in recent years has been Aberdeen. During Rangers’ four-year absence from the top tier, Aberdeen emerged as Celtic’s closest (positionally, anyway) challengers towards the top end of the division, finishing 2nd in each of the last three seasons. This season, they are on course to finish 2nd once again with Rangers struggling to get their act together following Pedro Caixinha’s disastrous reign in charge. Given how dominant Celtic are right now, it would be a momentous shock if Aberdeen were to topple them. 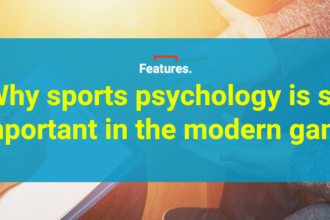 But while the same rings true on Football Manager, it isn’t a completely impossible task. 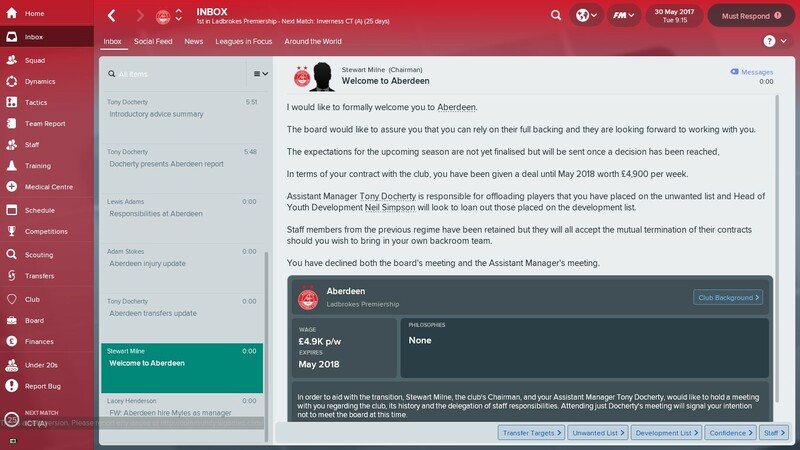 It has been over 30 years since the Dons were crowned champions when Sir Alex Ferguson led them to back-to-back titles and, should you take charge of the team on FM 18, your job is to follow in the great man’s footsteps and put an end to Celtic’s hegemony. Positives: Aberdeen have a strong squad and are in the Europa League! A left-field option to consider is Mexican side Pachuca who, as well as having a great name and lovely kit, are one of the nation’s most successful clubs, winning the top flight on six occasions including most recently in 2016. The main reason that Pachuca stands out for us, though, is not due to any of the factors mentioned above (although they do make them even more appealing) but instead, it’s down to their outstanding youth and training facilities. The club has superb youth facilities, good junior coaching and a well-established youth recruitment network which means it should be relatively straightforward to develop players from within. Hirving Lozano is the latest Pachuca product to make a name for himself and he’s currently tearing defences apart in the Eredivisie with PSV, whom he joined in the summer. Although you won’t be able to call upon the twinkle-toed winger on FM18, there are a clutch of exciting prospects still at the club, including the Jack-of-all-trades utility man Erick Aguirre, playmaker Pablo Lopez and midfield linchpin Erick Gutierrez. And if you need any further incentive to manage Pachuca, look no further than Keisuke Honda, who became arguably the club’s most high-profile signing in history when joining from AC Milan in July. 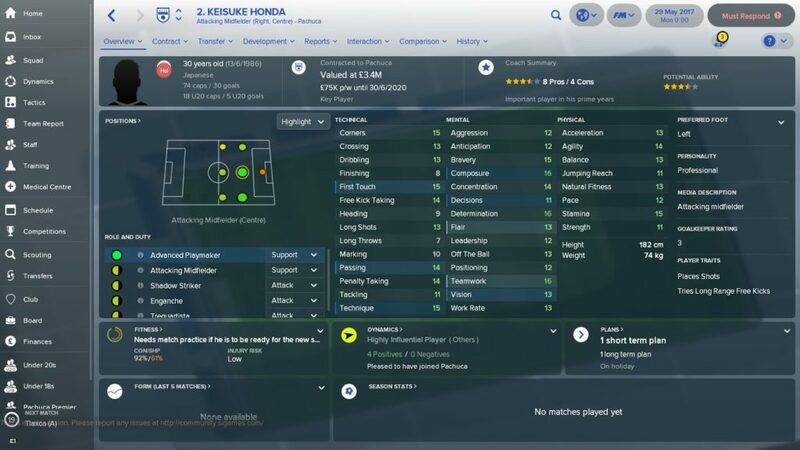 Despite being in his thirties, Honda remains a statistical marvel on FM and you can rest assured that he will provide the odd moment of magic throughout the season. Positives: They have an outstanding youth setup. Keisuke Honda. The 44-year-old goalkeeper, Conejo Perez. Negatives: Few leagues are quite as competitive as the Liga MX. It is going to be a long, hard grind. Also, Honda wears the No.2 shirt for some reason. Feel free to change that. All screenshots for this feature were taken from the Beta version of Football Manager 2017.